If you are a diver, the Great Blue Hole has become a bucket list dive for many aficionados. Measuring 1000 ft across, it is located in the centre of the Lighthouse Reef Atoll. I had my reservations because of the cost, but curiosity got the best of me. Did I enjoy it? Yes! Did I think it was worth $250 US for the day? It’s tough to say. The dive was unique, the deepest and coldest I have ever been under water. With no life aside from a few sharks swimming by - it is eerily quiet and I was glad to have the company of my diving boat. Although the dive itself only lasted twenty minutes, hanging out ‘in the blue’ is surreal, as were the gorgeous gigantic stalactites located 130 ft below the surface. If you weren’t completely satisfied with the Blue Hole Dive, fortunately there are two more beautiful dives at the Lighthouse Reef Atoll. All of the photos above are from various dive spots along the Reef and at Lighthouse Atoll, while the bottom right is from a snorkelling excursion in the nearby Hol Chan Marine Reserve. Aside from the Blue Hole, there are plenty of other amazing spots off the coast. 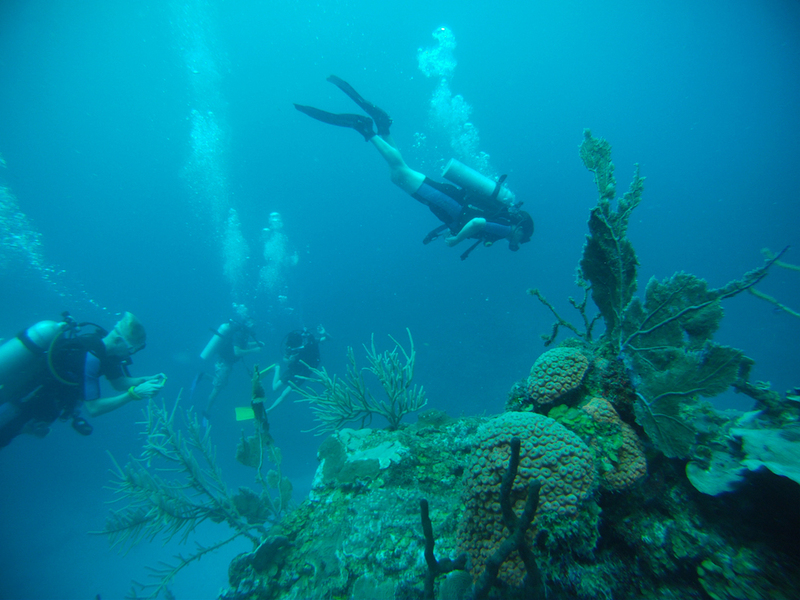 At the northern part of the Belize Barrier Reef, Esmeralda is a gorgeous site with long and deep finger-like canyons of reef jutting out, giving you the opportunity to navigate between or over them. There were also beautiful wall dives teeming with life, and more nurse sharks and rays than I could keep track of. So would I recommend the Big Blue Hole? Yes, but I also strongly suggest that you go out for at least another day. I did all my diving with Frenchies, one of the oldest establishments on the island. They offer better prices than some of the competition, but perhaps not offering the newest and shiniest gear on the market. Frenchie's also ask you to set your gear up yourself (supervised) which, while an important part of the PADI training, it is something that most dive-shops do for you if you are not taking a course - I thought that was great!